One of life's age-old questions: Is store-brand really as good as the name-brand? Unfortunately, there really is no easy answer for that one. I have had horrible (I really should spell that HORRIBLE) luck with some store brands and then great luck with others. It really depends on the store and the item(s) in question. As long as the quality warrants it, I prefer to buy the store-brand of several items: cereal, baking supplies, coffee, snack for the kiddos and dairy products. These are items that we purchase a lot of, so usually the savings is pretty nice. I headed to Smart & Final (they are on twitter and facebook too!) for our supplies - from bagels to cream cheese and jalapenos to chocolate chips - I got it all!! My shopping trip is here on Google+, check it out if you want to see inside a Smart & Final! One remarkable deal I found were these Strawberries, only $4.99 for 4 pounds, now that is awesome!! 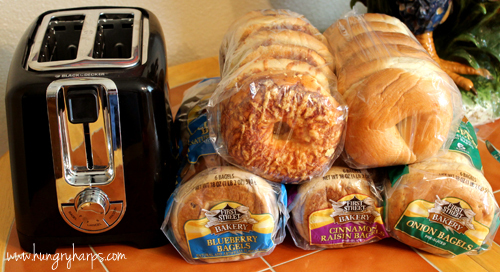 We took all the goods to my parents house and set-up a wonderful Bagel Bar! Prior to setting up our Bagel Bar, I had pulled both cream cheeses out of the fridge to soften. Mr Hungry Harp then put them into serving dishes for esthetic value. 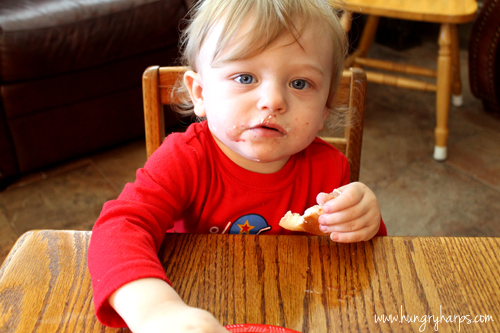 :) The First Street Cream Cheese was much softer than the Kraft Cream Cheese, making it easier to spread on our bagels. I also like how First Street color codes their packaging to match the flavors, green for onion, blue for blueberry, etc. Bright coloring always grabs my eye in the store - so it really serves as a dual purpose here! Our Bagel Bar had an array of toppings for anyone's bagel! For sweets we had honey, chocolate chips, raspberry jam, pineapple and strawberries. For the not-so-sweet we had green onions, salsa, jalapenos, spinach and tomatoes. For the meat-lovers we had bacon strips and cubed peppered turkey. Trust me when I tell you - you want to do a Bagel Bar!! It was not that expensive because we only used a portion of the toppings that were purchased - plus, I have awesome ingredients to make meals with for the rest of the week. Bonus! I can't wait to use those Jalapenos in something!! Here are some of the creations our crowd came up with. Some sweet and some savory - both delicious. It was SO much fun sharing our masterpieces with each other and tasting all the different flavor combinations. Ok, ok - so the verdict. Round#1 - Cream Cheese. Everyone was majorly impressed with First Street's Cream Cheese. It is not that is was "pretty good" for being the store-brand, it is just really good cream cheese. Everyone tried both the Kraft Cream Cheese and the First Street Cream Cheese and thought they were both of the same quality. 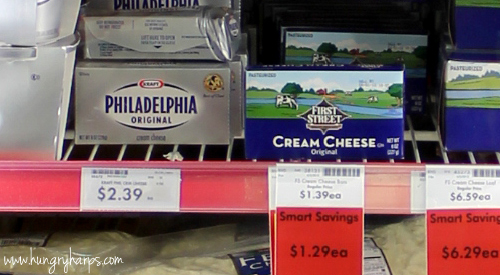 In the future, I will be purchasing First Street Cream Cheese for all of my cream cheese needs. Also, everyone loved the First Street's packaging over the Kraft - the scene with cows in a field really gives the "at-home" feeling. Round #2 - Bagels. Honestly, both brands of bagels tasted really good - so we could not pick one over the other based on our taste buds. 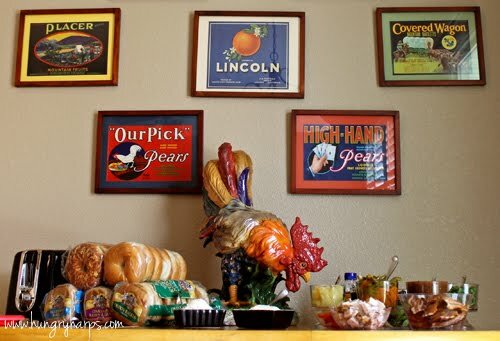 One advantage that the First Street bagels had over the "other" brand was that they are pre-sliced. I love having my kiddos help out in the kitchen and if a knife is needed - it's one less things they can assist with. The other thing everyone liked was First Street's packaging - the bright colors are a good way to start your day. 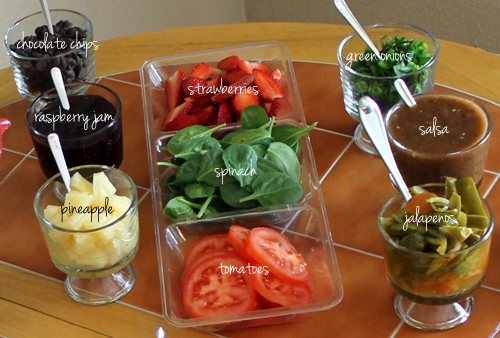 Plus I really like them being color-coded to the flavors - it makes it more fun for the kiddos when they help out! While not all store-brand items are as good as their national name-brand counterparts - First Street Bagels & Cream Cheese are just as good, if not better. 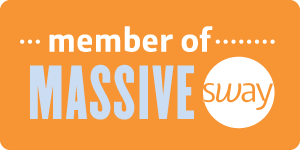 We are making the swap - the savings will be great! I love First Street cream cheese. It does taste exactly like the Philadelphia brand and you can't beat the price. 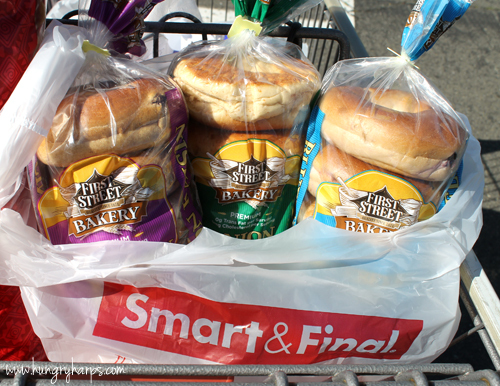 I haven't tried the First Street bagels, but I'm pretty sure I'll pick some up next time I'm at Smart & Final. Oh my gosh, this is amazing! 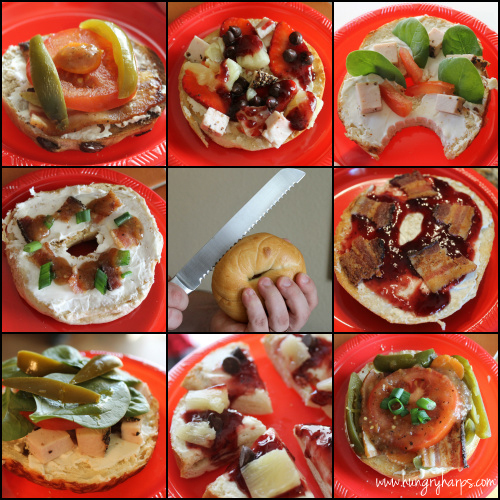 I love all of the bagel creations that you came up with!! Also, I love your home decor! !